Whether you’re looking for the functionality of added privacy and light control, or you just want to layer in some patterns or pops of color, it’s great to mix and match your window treatments. Here at The Shade Store, we have 12 custom products, and over 1,300 exclusive materials to choose from, so the combinations are endless! Keep reading for our tips on how to mix and match window treatments. One of our favorite window treatment combinations is layering a blackout Shade with a light filtering Shade or Drapery panel. Not only does this create a beautiful finished look, but it also allows you to carefully control light and privacy, depending on the time of day or your personal preference. This is a great option for bedrooms and other commonly used living spaces. Want to bring some excitement to your windows, but scared of going too bold? Pair a patterned shade with a more subdued solid, and you’ll achieve the perfect balance! 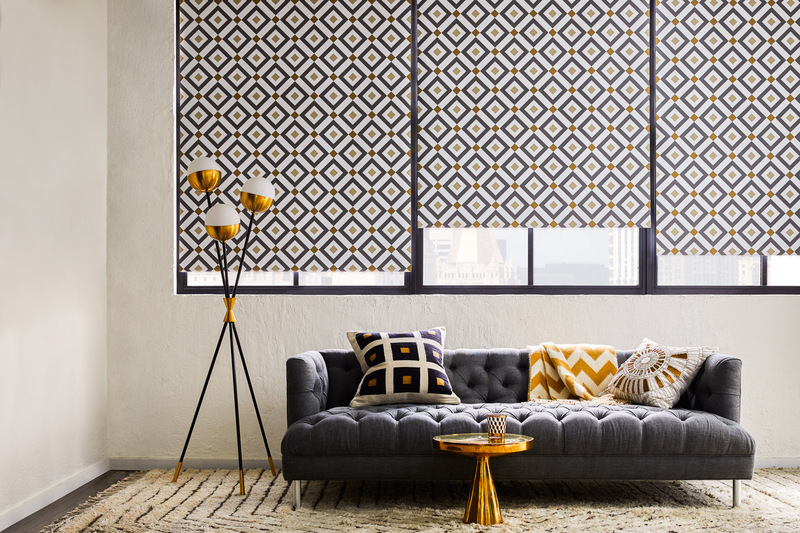 We have beautiful Roller Shades for every décor style, including designs by Nate Berkus, Jonathan Adler, and The Novogratz! If a more neutral look is your go-to, try mixing your textures instead. We carry stunning Woven Wood Shades in four distinct styles and over 90 natural, bamboo, and grass materials. 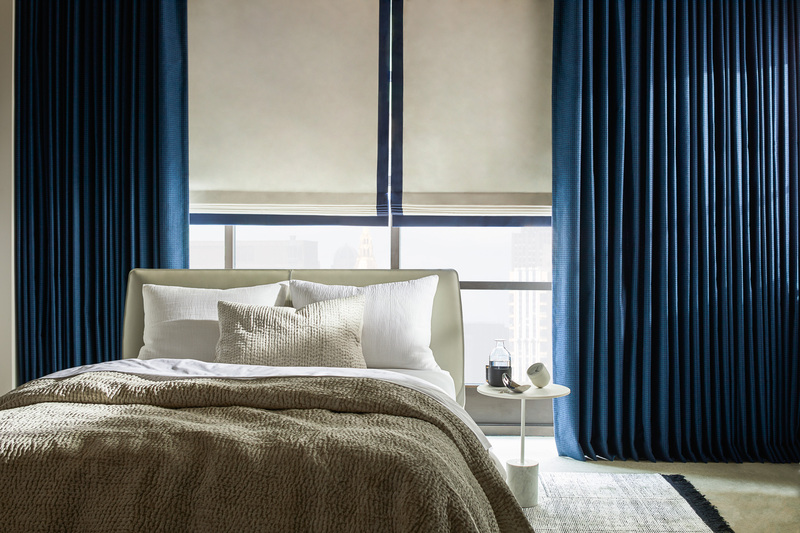 These shades are beautiful and versatile – they look lovely paired with Roller Shades, Solar Shades, or Drapery! Woven Woods are the perfect way to bring in some dimension, while still keeping your window scheme calm and neutral. This allows you to go bold with the rest of the space, too! Ready to mix and match your window treatments? Our expert design consultants are here to help! Visit one of our 55+ nationwide showrooms, give us a call, or email us at design@theshadestore.com to get started today! When it comes to designing a room in your home, there are endless choices to be made – some more difficult than others. Traditionally, selecting window treatments has proven to be one of the biggest home décor challenges. With so many options to choose from, it’s hard to feel 100% confident that you’ve made the best decision for your space. Luckily, we have changed all of that. We were founded with the purpose of providing a simple alternative to this usually difficult customer experience. With three generations of expertise, we manage every single detail – from inspiration to installation and beyond. The Shade Store offers a full range of options for your windows, including shades, blinds, and drapery. With exclusive partnerships with some of the best brands and taste-makers in the business, we are always on top of the latest trends and styles. Keep reading to find out the three key trends we are seeing right now. One of the best ways to bring an extra-custom, designer feel into your space is to layer your window treatments. With our extensive collection of products, there are many different combinations to choose from – a Solar Shade under a Roman Shade, a Roman Shade under Drapery, or even a Cellular Shade under Drapery! We love helping our clients get creative, mixing patterns and textures, to create the ultimate personalized space. 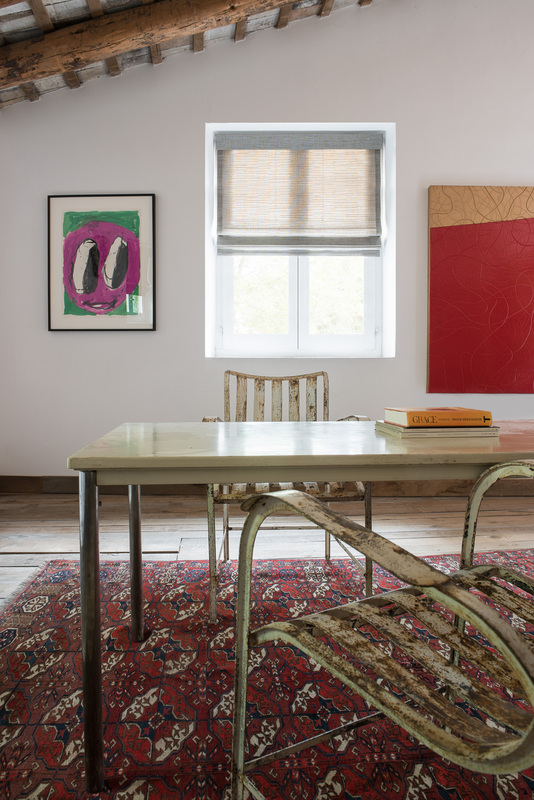 An additional benefit to layering is that it presents the opportunity to control the amount of light let into a room. By pairing a blackout shade or panel with a light filtering one, you can have a full range of light control. Across all décor styles, from bohemian to modern, we are seeing a huge shift toward the incorporation of natural materials. Both our Woven Wood Shades and our Wood Blinds are perfect choices if you’re looking to bring the beauty of nature into your home. Our Woven Wood Shades are available in four custom styles and over 100 exclusive materials, including Bamboo, Grass, and other natural weaves. Each shade is constructed by a skilled artisan and creates a rich, organic feel. Our Wood Blinds are handcrafted with the finest woods from sustainable resources, and available in over 65 exotic finishes. They are durable, versatile, and classic. All of our wood blinds are eco-friendly, too, so you can feel good about your purchase. Technology has transformed the way we live our lives. We are constantly looking for streamlined simplicity. 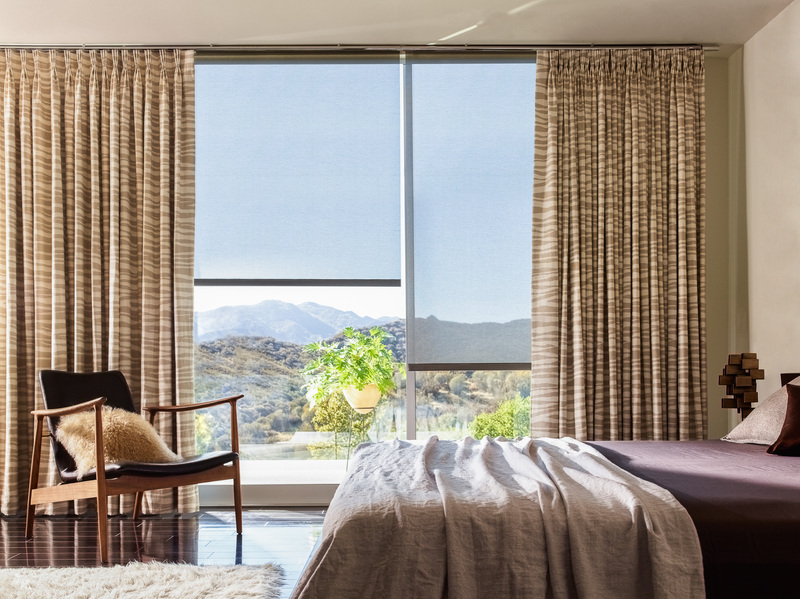 Because of this, one of the biggest trends we are seeing for window treatments is motorization. 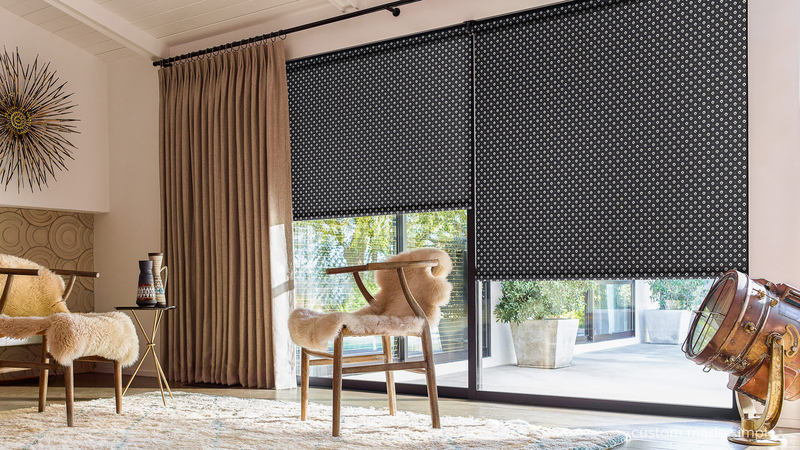 At The Shade Store, we offer a state-of-the-art collection of motorized Shades, Blinds, and Drapery. This exclusive new collection is whisper quiet, has eco-friendly battery operation, the ability to set timers and favorite positions, and smartphone control. Our motors are of superior quality and reliability, and are customizable for everyday life. Visit one of our 55+ nationwide showrooms to experience all that we have to offer. See the styles, browse drawers of material swatches, and even test out motorized shades. Each of our showrooms is staffed with expert Design Consultants ready to help you narrow down your choices and design the ideal window treatments to fit your space! When it comes to forecasting window treatment trends for 2018, it helps to take a look at the direction of the rest of our visual culture is moving toward. It’s no surprise that there has always been a strong link between fashion and interior design. The two are constantly influencing each other, especially since there is a growing number of designers that now straddle the two realms, gracing both with their talent and well-trained eyes. We’ve seen many new trends for 2018 emerging on the fashion runways, and when it comes to layering new décor into our homes, we should definitely be taking notes. 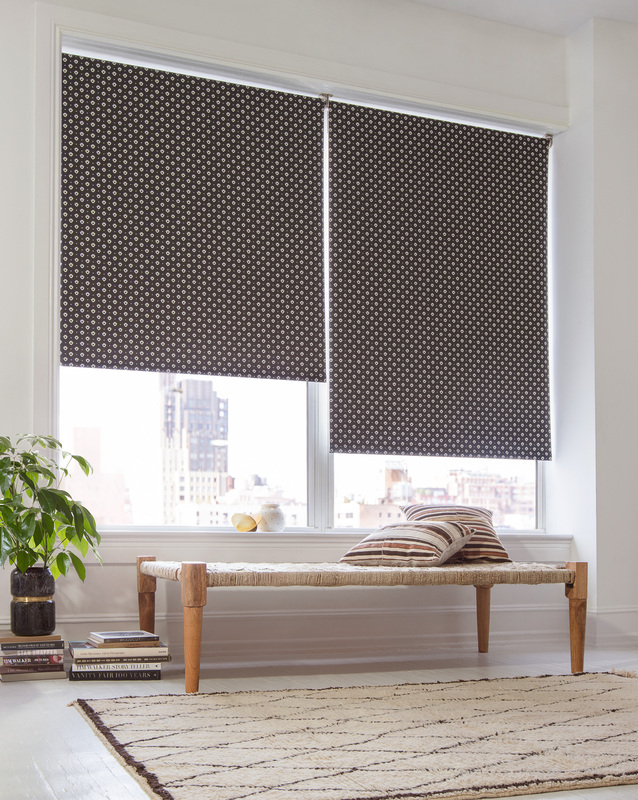 At The Shade Store, we have a wide selection of custom Shades, Blinds, and Drapery. From bold patterns to minimal solids, we have the perfect option for every style. Here are some of the latest trends for both your wardrobe and your home — and the perfect window treatments to choose for each! Straying far from the minimal, neutral solids of past years, we are seeing a huge comeback of large-scale patterns for both fashion and home. 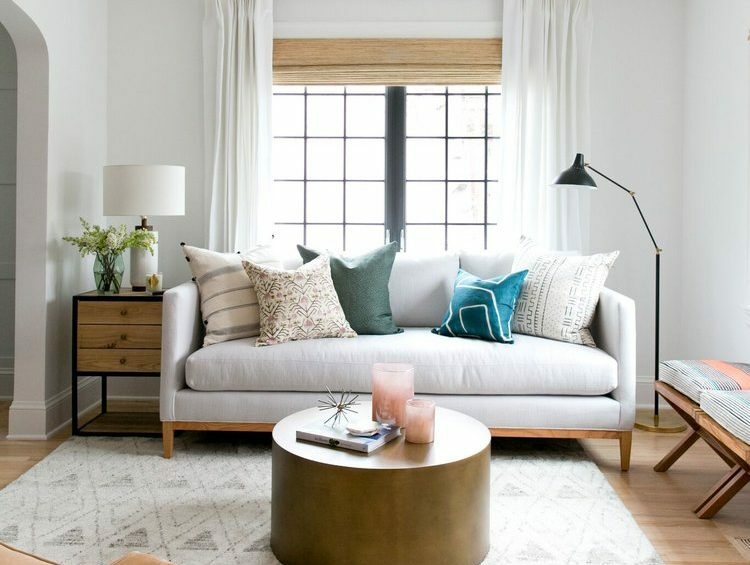 Whether you want to go graphic everywhere, or you just want to liven an understated room, there are many ways to style this trend in your home space. 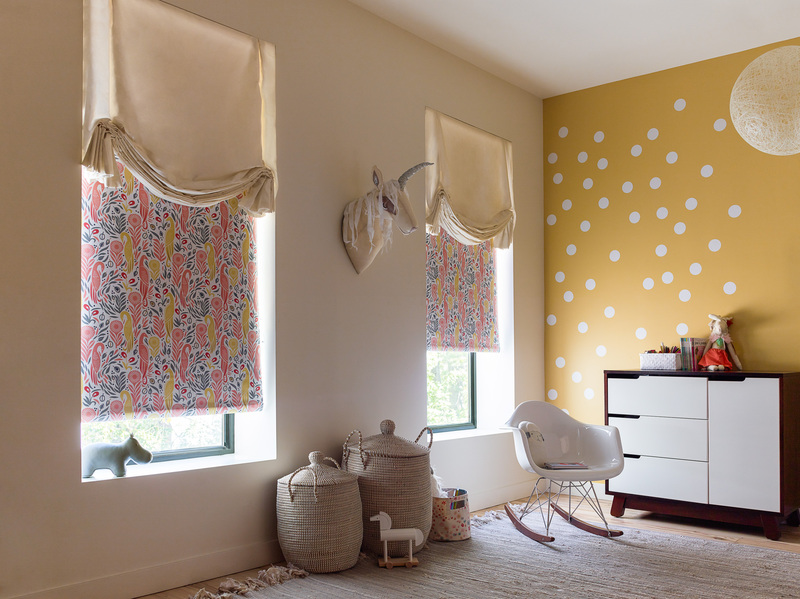 Our new line of custom Roller Shades with Jonathan Adler is colorful and chic, full of bold, yet versatile designs. The collection is available in 6 stylish patterns in both light filtering and blackout materials. Just because bright and bold patterns are in, does not mean that neutral prints are out! As our culture continues to embrace organic materials and natural beauty, we are seeing global-inspired colors and prints on the rise. Our Nate Berkus for The Shade Store Collection was designed by Nate Berkus, inspired by his worldwide travels. He has delivered us a sophisticated combination of neutrals, soft colors, and hand-drawn prints. The collection is breezy and effortlessly stylish – perfect for any space. From the biggest fashion designers in the industry (think: Tom Ford, Marc Jacobs) to the newest emerging creators, we are seeing an abundance of shimmering, glittery, and sequined fabrics. And while metallic accents and décor have been on-trend for a while, the tasteful inclusion of glitter and sequins is a new movement for interior design. If this glamorous look is something you aspire to achieve, we have some great selections for you. 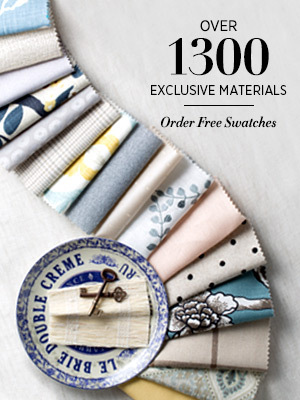 Our Sheer Brilliance Material Collection is available for Roman Shades and Drapery. 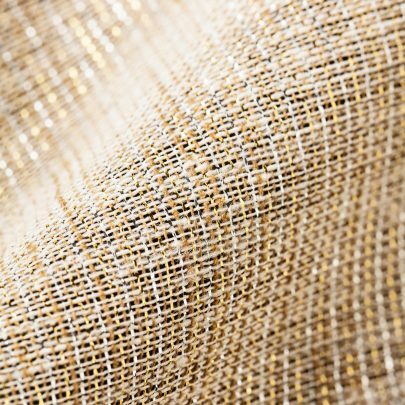 The translucent fabric is woven with sparkling fibers, and looks great as a standalone, or paired with another Shade. 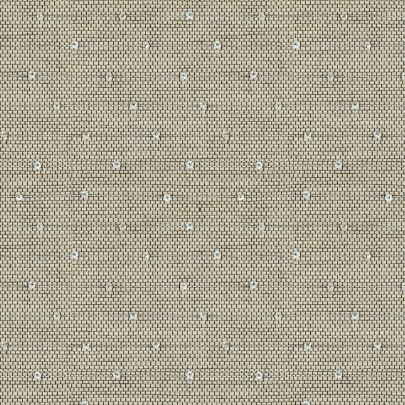 Our Guthree material in Beaded Pearl works great for Roller Shades, Roman Shades, Woven Wood Shades, and Vertical Blinds. This natural material has simple sequins sewn in throughout, giving off a refined, but fun, touch of glam. Velvet pieces have been a popular fashion staple as of late, dotting both the runways and the most stylish city streets. Similarly, velvet has been called the “it” fabric of 2018, popping up in beautiful homes everywhere. Although it’s most commonly seen outfitting sofas and side chairs, velvet can be used on your windows, too! 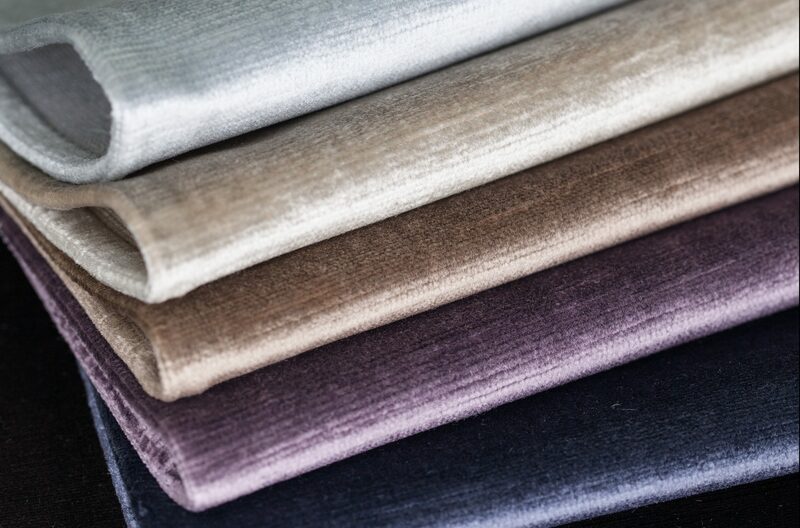 Our Velvet Collection is available for Roman Shades, Drapery, and Cornices. It is available in 10 rich colors, each bound to give your décor that super luxe feel. Tulip Roman Shade in Herringbone Toast. Roller Shade in Grove Grey. 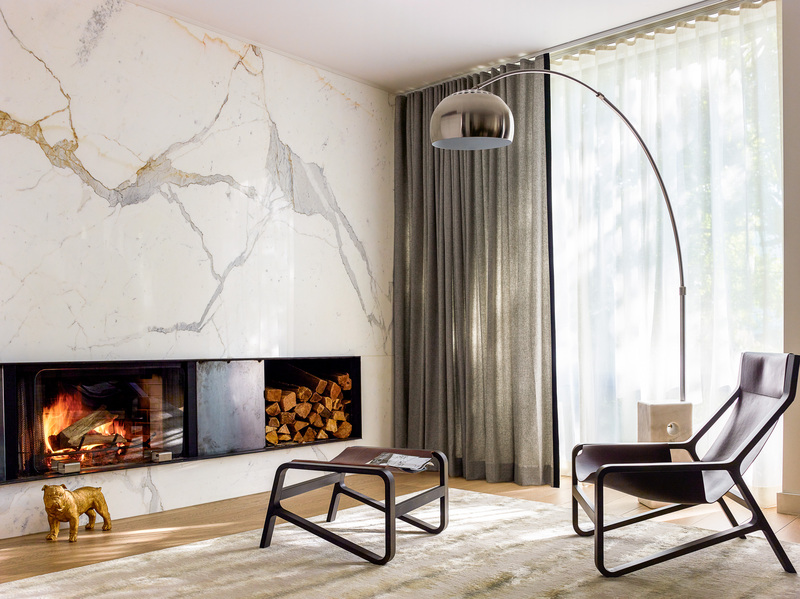 Layering textures and materials is another big trend right now in the fashion and home worlds. This is an easy (and functional!) one to bring to your windows. When it comes to layering window treatments, not only do you create an extra-custom, designer feel, but you also are able to finely control the amount of light let into a room at any given time. 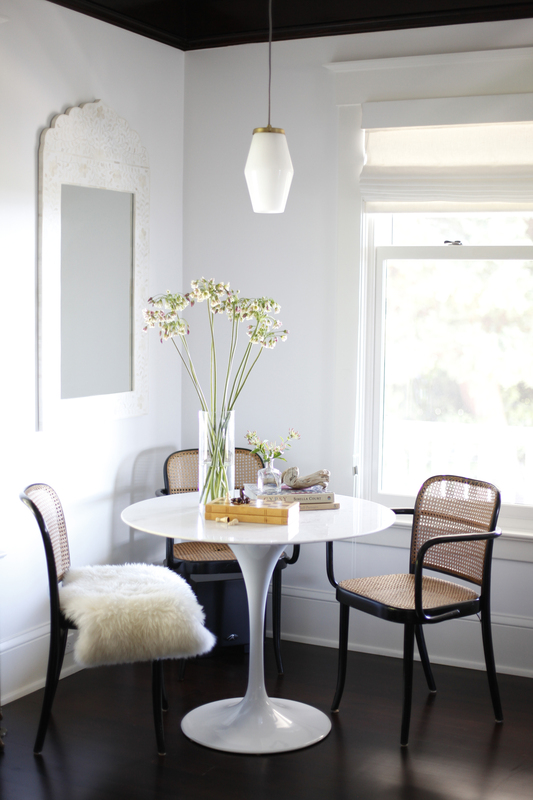 Put a blackout-lined Woven Wood Shade under sheer Drapery, or a Solar Shade under a blackout Roman Shade. You can get creative with your pairings to find the perfect solution for your space from both a visual and a practical standpoint! 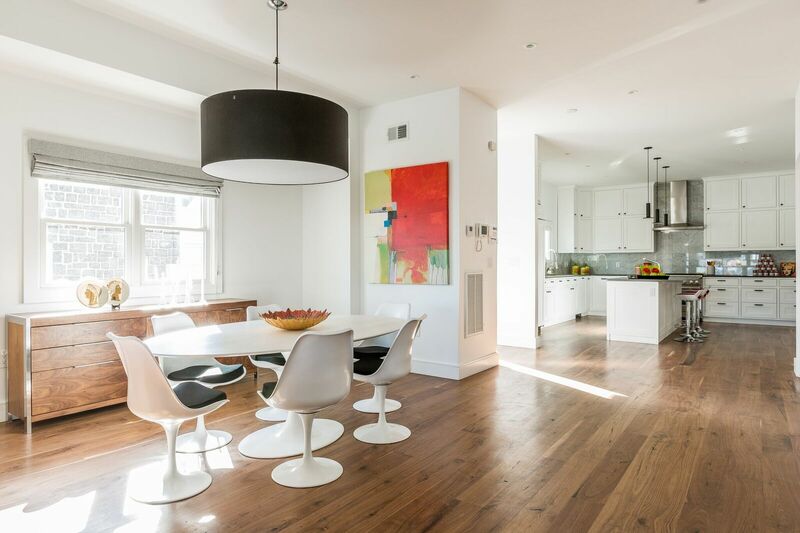 Our expert Design Consultants have tips on all of the latest design trends. 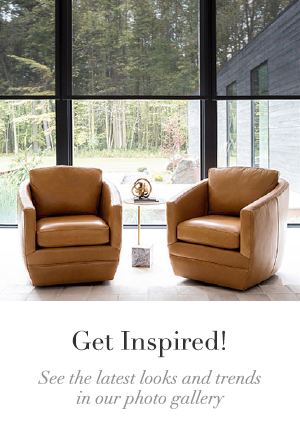 Visit one of our 55+ nationwide showrooms, give us a call, or email us at design@theshadestore.com. Relaxed Roman Shades in Linen Blend White. Design by Urbanology. While shopping for custom window treatments, there are many questions to consider. In addition to selecting your style, material, and color, you’ll need to decide whether your shades will mount inside or outside your window frame. Sometimes, this choice is just a personal design preference, but there are practical benefits to both styles as well. Outside mount window treatments are great if you want to make your windows look bigger, or to bring a more dramatic feel into your space. 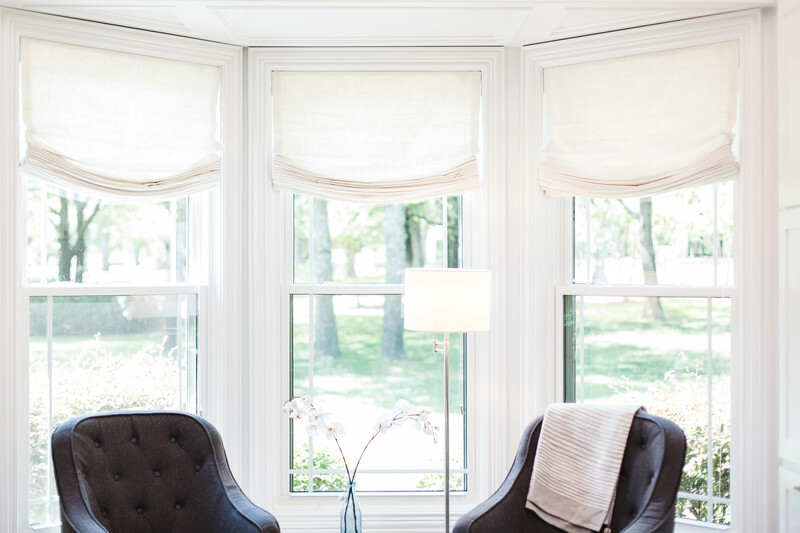 Inside mount shades provide a cleaner, more built-in look. Keep reading for more reasons to choose an inside mount! Relaxed Roman Shade in Linen Natural. Design by Allison Jennison. Inside mount window treatments are the perfect solution for smaller spaces, as they don’t have to take up any additional room beyond your window. The necessary depth measurement for an inside mounted shade is 3/4” of space. As long as your window meets this requirement, your shade can be installed securely, and will take up minimal space beyond your window. If your design style leans toward minimalism, inside mount window treatments are a great choice for you. They look very clean and modern. Additionally, if you have beautiful woodwork and detailing in your home that you don’t want to cover, inside mount shades are the best choice. Whether your shades are raised or lowered, the frame of your window will never be covered, allowing the architectural elements of your home to take center stage. Another great thing about inside mount shades is the opportunity that they present for layering! Layering your window treatments not only looks great, but it allows for flexibility in the amount of light you let in. Try an inside mount Roller Shade with an outside mount Roman Shade, or an inside mount Woven Wood Shade paired with Pinch Pleat Drapery. No matter what combination you choose, your windows are bound to look beautiful! Our Design Consultants are happy to help if you have any questions about which mount type is the best fit for your windows. Visit one of our showrooms or give us a call at (800) 754-1455. Flat Roman Shade with Valance in Herringbone Mist. Design by Nicolette Brand. Window valances are a great way to add structure and polish to the top of your windows. At The Shade Store, we offer several varieties of clean and simple valances to complement our Roman, Roller, Solar, and Woven Wood Shades. 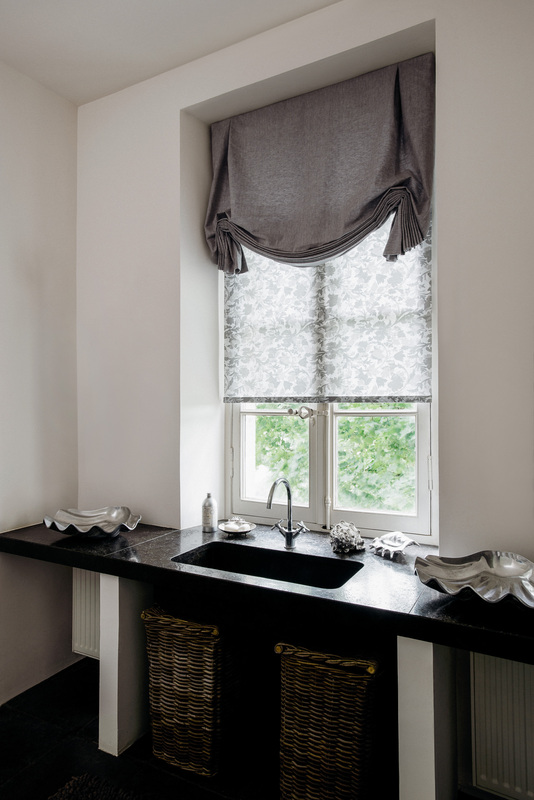 Here are our favorite window valance ideas and where to use them. Upholstered valances are 4” tall and handmade to coordinate with the material of your shade, giving the treatment a clean and finished look. The valance adds 1” of width to an outside mount shade.If your windows do not have any trim, an outside mount valance can provide visual weight and interest to an otherwise simple window casing. For squat windows or low ceilings, you can let the valance sit above the top of the window frame to create the illusion of a bigger window. Valances are also ideal for hiding window treatment mechanisms. If you have wide or multiple windows and have chosen to mount multiple shades on one headrail, a valance covers the locations where the multiple shades meet the rail and makes the multiple shades look cohesive. Flat Roman Shade with Valance in Linen Ivory. Design by The Emerald Studio. For Roller and Solar Shades, metal valances are available in white, silver, and espresso finishes, as well as a fabric insert option. Exposed metal valances look right at home in modern and industrial designs, and can mirror an optional exposed bottom bar. 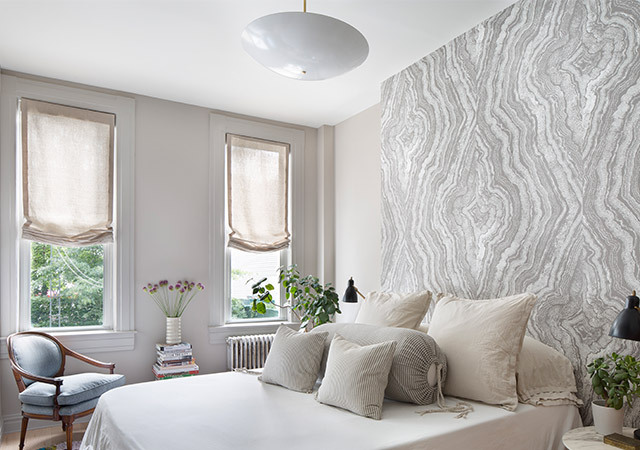 Perhaps you have a small window or a glass door that doesn’t need a full window treatment, but you want its design to tie into the rest of the room’s window shades. Maybe you have a window that does not require any added privacy or light blockage, but it looks bare without any dressing. A standalone valance is the perfect solution for these types of situations. A valance will add a touch of color and softness to your window without a full shade. 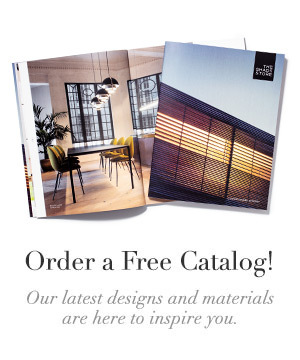 Visit one of our nationwide showrooms to see our shades and valances in person, request a free catalog, or give our expert Design Consultants a call at (800) 754-1455.